First: Big huge apologies for all the ridiculous spamming action happening on your feedly feeds and on my homepage here lately. I’m not sure who or what is behind it, but one thing is clear: I have been hacked. And though I’m not exactly going to tell you it’s been fun, I will say that I’m touched by all the emails from concerned readers — so many of whom ended up writing Post Scripts expressing appreciation for DALS in general. I appreciate this appreciation more than you could ever really know. It’s truly why I’ve been able to keep this blog up and running for more than six years. So thanks for that. Next: Our dinner on Saturday night. Wowowow. Yesterday Andy texted me “How good was our dinner on Saturday night?” This was around noon, a full 36 hours after we had finished (licked clean?) 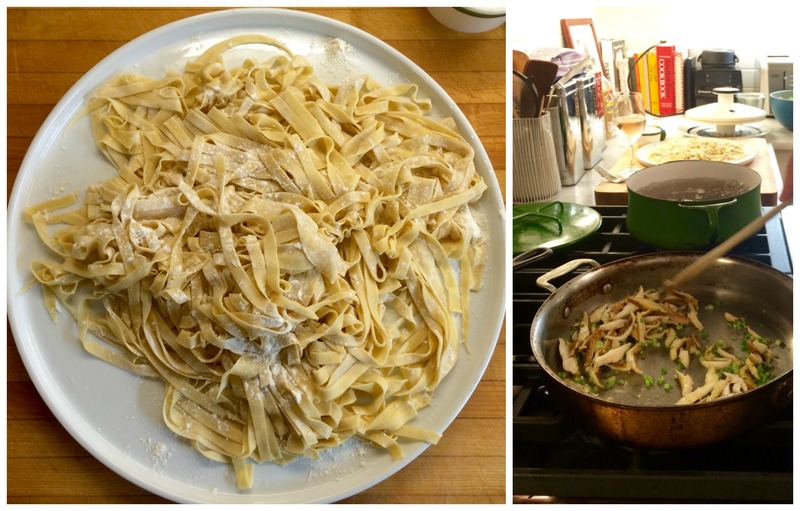 two bowls of homemade fettuccine, and yet the fettuccine was still very much top of mind. That night, Phoebe was babysitting (My baby! Babysitting!) and Abby was at a slumber party, and instead of bolting to our favorite neighborhood haunt and eating dinner at the bar like we usually do, we decided to embark on a Project Dinner. As in homemade pasta. This is not the kind of thing we take on very often, but every time we do, we wonder why the heck we don’t. Of course, cranking your own noodles is way more complicated than buying them, but that was sort of the point, and plus, it’s really kind of insane what a dramatic difference homemade noodles make. I wouldn’t have had any problem paying 20-plus bucks for our dinner if someone served it to us at a restaurant. That’s supposed to say less about us being wizards than it is about just how little you have to do once you have a few piles of those fresh, floured, lovely ribbons in your fingers. Here is what we did. Set pasta pot on stovetop and bring heavily salted water to a boil. As you wait for water to boil, add olive oil, butter, and red pepper flakes to a large skillet set over medium heat. Add mushrooms, spring onions, salt and pepper, and cook until wilted. Add chicken stock and bring to a simmer. Keep on low heat. Cook pasta until al dente. (If it’s homemade, it will not need more than 2 to 3 minutes.) When pasta is ready, using tongs, transfer noodles to the skillet. (It’s ok — no it’s good — if a little bit of the starchy pasta water drips into the skillet along with the noodles.) Toss with the mushrooms so the mushrooms are evenly distributed. Drizzle in the tiniest amount of heavy cream, tossing until noodles look just coated and not soupy. Serve in pasta bowls with generous topping of Pecorino Romano and more freshly ground pepper. Yes! Homemade pasta is the best, so worth making and so delicious. I made this tonight, no chives so I used sage and rocket. Delicious! I was going to write to you this morning re the spam. How frustrating that must be! It seems like all the spam posts I saw were “authored” by Andy, if that helps. We received a pasta crank as an unsolicited wedding gift and decided if we hadn’t used it in five years, we’d pass it on. Less than six months to go… You’ve inspired us! Sorry about all the spam. I love your blog and your books! Does your vinaigrette have vinegar in it?? I got pasta making things for Christmas in 2014 and have yet to use them. This teacher is about to be on summer break and she’s in inspired. Thanks! Lemon juice is a vinegar (acid) substitute in salad dressing. It provides a bright note! that’s funny! I hadn’t really thought about it. I guess I should call it “dressing.” Either way, you know what I mean! On the topic of appreciation, as well as your first book, I wanted you to know that we have used your books so much that about 20 pages of your first book has fallen off the binding. We just shove it back in and keep on using it, but I wanted you (and Andy) to know how much it is appreciated. The fettuccine recipe is in the part that is still stuck to the binding, and we’ll give this a try soon. Many thanks for all your insights! My DALS book is totally coming apart at the seams. It’s also covered in wine splatters and various ingredient stains. I keep it all together with a giant rubberband. It’s definitely our family go-to cookbook. All it really takes is someone talking about fresh pasta and I’m running to the basement for the pasta maker. The pictures nearly pushed me over the edge. But I have trunkful of annuals that need soil and pots, so that will have to wait… briefly. But I’m definitely adding this to the weekend to do list. Don’t know if you’ve tried it, but I have to say that I LOVE King Arthur Flour Co.’s Perfect Pasta Flour. I can really tell the difference when I have to use anything else. Thanks for the inspiration, as always. How do you feel about the kitchen aid mixer attachment for pasta? Ps. I could use an occasional babysitter for my 5 year old! We live one town over!! I love project dinners 🙂 and fresh pasta is my favourite! yum!